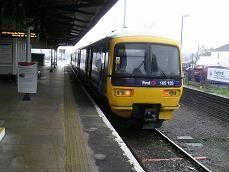 Twyford is the last station before Reading on the Western mainline and has 5 platforms, though two of these aren't usually used. It is a typical red brick Victorian station building with an island platform in the middle, where most passengers alight to and from the stopping trains. The Henley train platform is on platform 5, on the northern side of the station. We leave the mainline as soon as we pull away from the station across an unusual pedestrian crossing, which links the station car park with the station. South of the station are mainly fields giving it a rural feeling, whilst to the north are rows of terraced houses. There is a drop of about 30 feet on the right as we curve sharply to the right, before entering a cutting, thick with vegetation. We soon emerge into open countryside on the left and more houses on the right. We start to speed up to about 50 mph, which on old track gives out the clickety click sound before we move onto welded rails. We large nurseries on the left and right, growing some sort of shrubs or trees, or maybe vines. There are metal poles bent over the plants but no plastic covering them. We soon arrive at Wargrave, which has a single platform with a blue bus stop, free of graffiti. There are some large houses near the track but not much else. We now cross over the River Thames. On the right there is a type of Boat Park, which is fairly empty, but on the left is a very unusual sight - a small island, which is dominated by a full-sized Indian tepee. There seems to be lots of straw in it so maybe it is used as a shelter for ducks or some other animal. The river Thames swings round in a large curve on our right and its course is easy to spot due to the large detached houses, which can be seen on its bank. Shiplake station is next, with the remains of a second platform, which has been filled in at the far end. Out in the car park the original Shiplake GWR sign is still standing. There's a modern bus shelter here as well as a large tree in the middle of the platform. There's also a strange looking brick building with a brightly painted blue door on it. It has two walls and is joined together by the blue door. It has a traditional BR logo on the top. It's almost like a Dr Who Tardis! It must be something to do with the station, but if anyone knows it's use let me know. The station sign for Shiplake says, "Alight here for the Thames path". As we leave the station we go over a level crossing, before emerging into open fields on both sides of the track. The train speeds up through the open countryside, which is punctured with the odd farm or stables, though the river Thames remains hidden until just before we arrive at Henley. There are small industrial units on the left indicating that we are nearing Henley-on-Thames. Once again the River Thames comes into view on the right through a pleasant looking park. As we pull into the station there are wooden clad blocks of flats on the right and a large empty car park on the left. There are plenty of passengers waiting to get onto the train - around thirty in all. The actual station building was rebuilt in the 1980's; though it's hexagonal shape is quite unusual.